The hen weekend things are just about done. I just need to check over the goody bags tomorrow night and finish the last bits on the t-shirts! 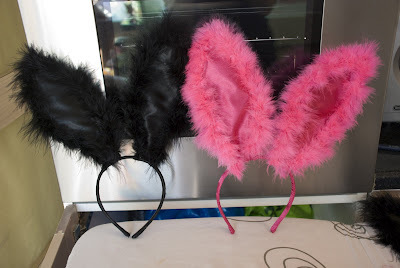 5 sets of fluffy bunny ears are ready for a party! 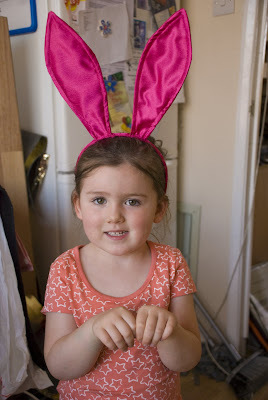 To make bunny ears, you need some strong wire, a solid headband (plastic, not stretchy and preferably not padded), and your chosen fabric with matching thread. Depending on your fabric, you may also need iron on interfacing. 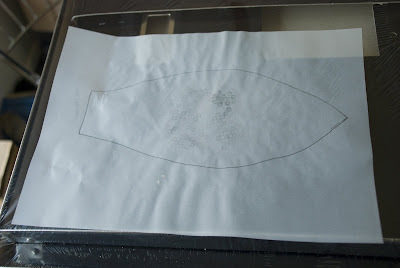 First draw an ear template. They're your ears, so you can shape them however you like. 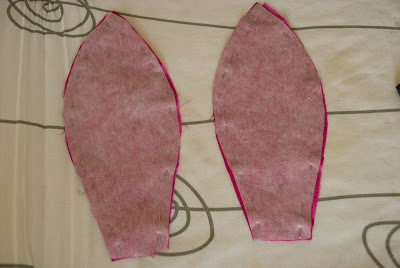 Cut 4 times out of your chosen fabric. 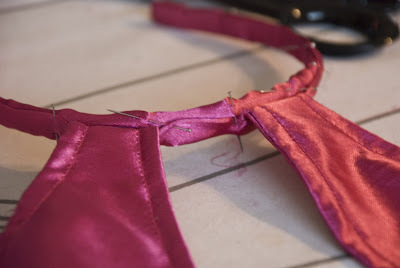 If you are using thinner material (like I have - Satin) then use iron on interfacing to give the fabric some weight. Pin right sides together leaving the flat base of the ear open. 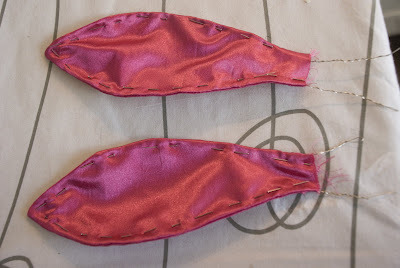 Sew each ear along where you have pinned (leaving the bottom of each ear open). Tie off the ends, trim and clip the seam allowance. Cut 2 lengths of strong wire long enough to fill around the inside of each ear with an overhang that will wrap around your chosen head band 3 times. Bend the wire to a soft point in the centre and insert one wire into each ear. Move the wire around until it sits as close to the seam line as possible. Stitch along where you have pinned to permanantly hold the wire in place. Bend the open base into a 90 degree angle. 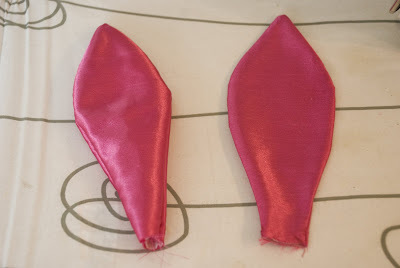 The folded piece should be the same depth as the head band you have chosen. Use the over hanging wire to wrap around the headband and hold the ear in place. (Experiment with your spacing). Cut a strip of the same fabric to 4 time the width of your headband. Wrap this fabric strip around the head band overlapping the pressed edges on the top side of the head band (This allows the ears to fit through) and pin. If You're working with a fabric that keeps moving, use a little double sided tape to help hold in place. 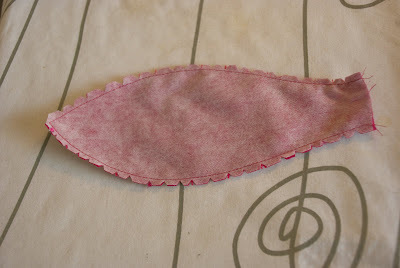 If You are using a fabric that does not fray (such as felt) you need not cut such a wide strip and press the edges under. Just cut enough to cover the band with a small overlap. 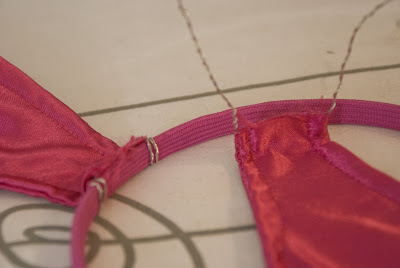 Hand stitch where you have pinned with a small whip stitch and voila! Bunny ears! You can leave them as they are, or decorate with various trims like I have. Just be careful not to use any trim that is so heavy it will weight the ears down and make them flop (like I nearly did!). Sorry if that is hard to follow. I wasn't really sure how to lay it all out. If something's not clear, just ask and I'll hopefully put it right.